The .357 Sig Cartridge was designed in 1994 to provide the same ballistic performance as the 357 Magnum round. 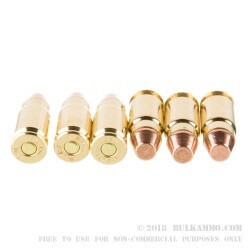 The bullet is technically 9mm in diameter, but the powder load is larger. The 357 Sig load is renowned for its accuracy and terminal velocity. It is used exclusively in semi-auto handguns and has multiple cartridge manufacturers producing the rounds in many different configurations. 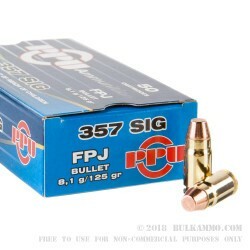 The 357 Sig round set the standard for these small pistol, angled-neck type cartridges with many others hitting the market soon after the 357 Sig did. 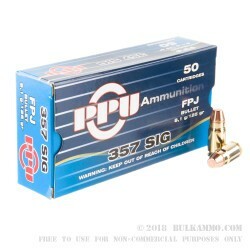 These Prvi Partisan 357 Sig cartridges are topped off with a 125 grain Full Metal Jacket flat nose bullet. And the bullet is seated into a new high polished, thick walled, heavy duty, reloadable brass case with a non-corrosive, small pistol, Boxer primer. These have a hard-hitting muzzle energy of 660-foot pounds, and a rapid moving super-sonic speed of 1542-feet per second. 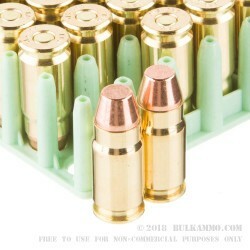 The rounds are perfect for a day at the range shooting your 357 SIG or an extended weekend with this bulk 1000 round case. Get your case today.